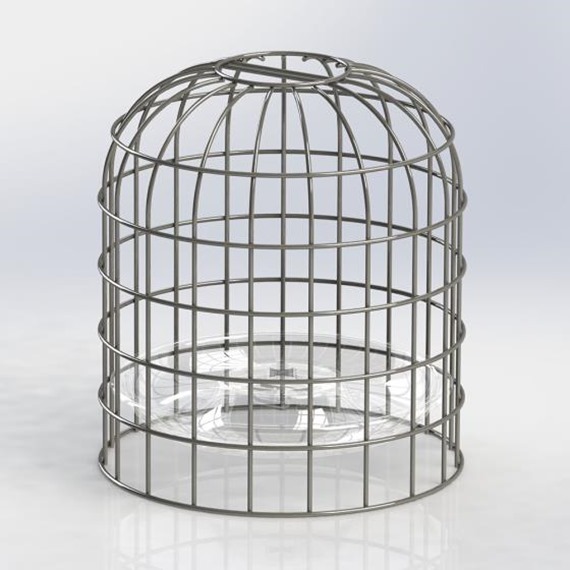 Bird Feeder Guardians (BFG-SM1) - RWBF Co.
Small and large guards to protect your feeders from hungry squirrels! These Bird Feeder Guardians in green painted steel protect tubular feeders and their contents from raiding squirrels. They are compatible with many tube feeders which have a 1/2" screw thread on their base; the Droll Yankee New Generation Lifetime* Range, the Droll Yankee Bird Lover* Range,and the Ringpull* Range. 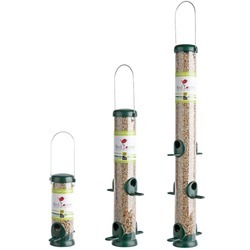 The large Guardian will accommodate a 4 port tubular seed feeder, and the large peanut feeders, measuring a maximum of 380mm long and 85mm diameter. 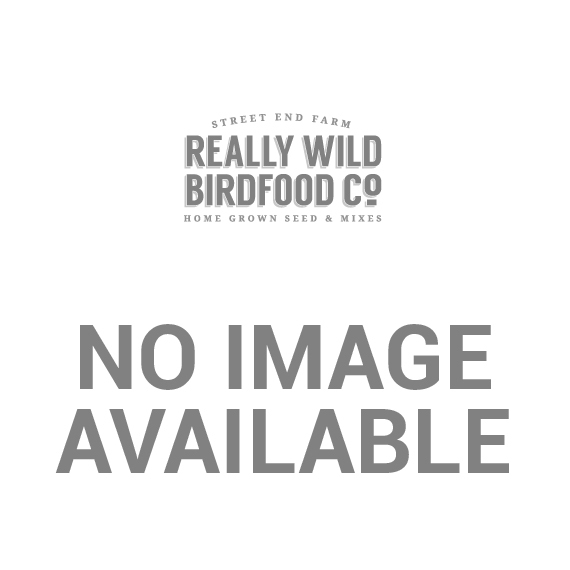 The small feeder Guardians will accommodate a 2 port seed feeder in the ranges mentioned above, or tsmall peanut feeders up to 236mm tall. The Guardians can be pole mounted or suspended. They are easy to use; the domed base attaches to the bottom of a feeder by means of a baselink nut, or a pole adaptor (if pole mounted). The cage lifts off easily for refilling and cleaning, with no need to detach the domed base from the feeder for these activities. The domed base allows easy run-off of water and dropped seed, and the gnaw-proof steel bars allow easy access to a feeder for the smaller birds- but not the squirrels! One of the best squirrel exclusion cages I have seen. Strong gauge wire and a very neat idea for the base. Very young/small squirrels can just squeeze through though when they are hungry. These well designed guards are invaluable. I have them on my seed feeders and peanuts and they successfully deter the hoards of squirrels and larger birds in our garden (although some parakeets have worked out how to access them as they can cling on to the wire). They also allow robins and sparrows to use the feeder which is a bonus. Quite expensive initially but worth it.